Sammie, the office pug, is known for many things around the office… there’s his friendly nature, his wheezing excited grunts and of course his fondness for knocking over trashcans to feast on whatever he finds. It’s the last one that usually means we have to keep him penned into a safe zone for some of the day, allowing us and our trashcans a little peace of mind. We just didn’t count on one thing. He’s learned to open doors. This is the second gate that we’ve bought to try and stop Sammie from escaping into downstairs JibJab, but to no avail. The first was a very simple gate like this one, which no amount of reinforcing could hold Sammie back. This time we thought we had him beat, with a futuristic plastic gate that featured buttons. BUTTONS. He wouldn’t be able to solve a button locked gate… right? Wrong. It only took him a few weeks, but he did it. Witness an old dog learning new tricks, caught on hidden camera. This entry was written by paulhanges and posted on September 17, 2009 at 10:17 am and filed under Inside JibJab. Bookmark the permalink. Follow any comments here with the RSS feed for this post. Trackbacks are closed, but you can post a comment. I am allergic to dogs, and usually don’t have an opinion one way or the other about them, but working with Sammie is AMAZING. This is an amazing dog! Dogs like t be with their people. Leaving him alone at the top of the stairs seems a poor answer compared to actually taking the time to teach him via positive reinforcement to stay out of trash cans. Watch “It’s me or the dog” for good examples of positive reinforcement. 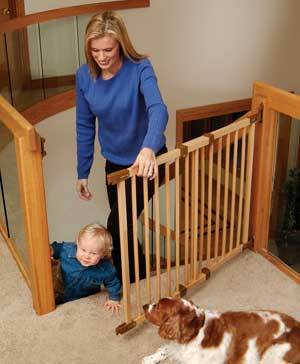 Teaching him will give him the ability to roam and still be safe, but it is more trouble than a silly plastic gate. Personally, that’s my opinion of how this stuff happens, people just do not want to take the time to teach the dog. You have a sweet, smart dog there- don’t be one of those people. You will regret it later when you learn how bad you have limited the pup. No worries, Jenni. Sammy’s zone is the same upstairs area where Gregg and Evan sit all day long. He just gets a little fidgety when they have to sit in a meeting.